and you'll never feel lonely at night when you're in bed. and you'll never be lonely at night when you're in bed. 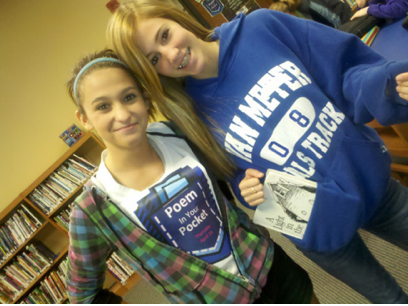 Yesterday Van Meter and Brook Forest celebrated national Poem In Your Pocket Day together. 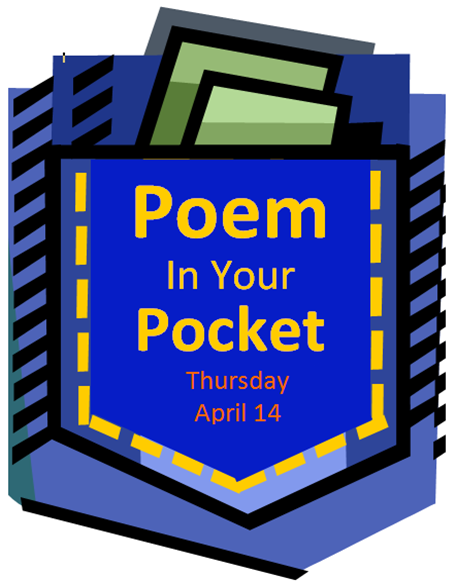 Poem In Your Pocket Day is an easy day to celebrate--simply place your favorite poem in your pocket and share it throughout the day. 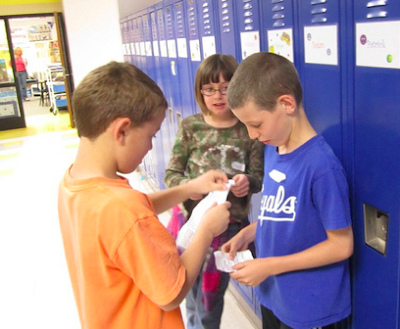 You can share your poem in the classroom, in the hallway, in the lunchroom, on the playground....anywhere! Our first step was to create signs and displays to make everyone aware of this special celebration. 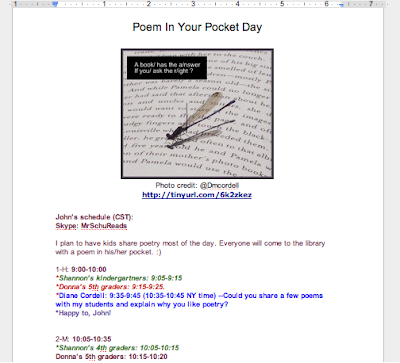 We also added the details of the day to our library blogs, websites and the wiki we created together for poetry month entitled What Words Do You Send Out Into The Air? 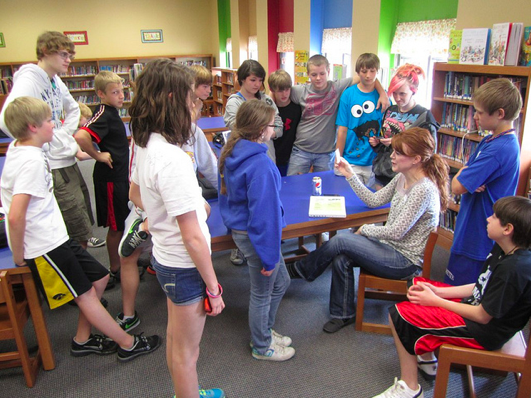 (which by the way will continue to grow throughout the month of April with the poetry projects we are creating in our libraries). 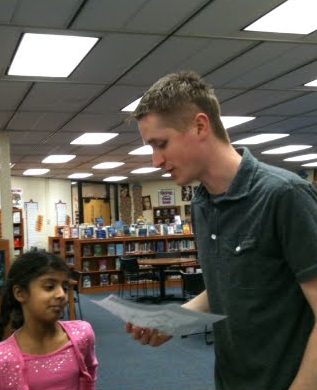 We encouraged students to write their own poems and gave them time to browse poetry collections. 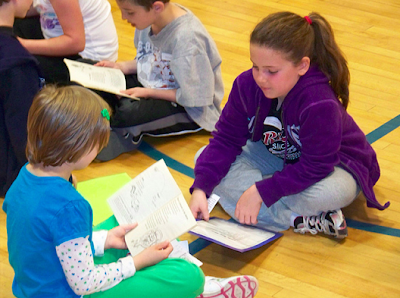 The poems were copied and given to each student for their pockets. They also practiced their poems and were ready to share on the special day. 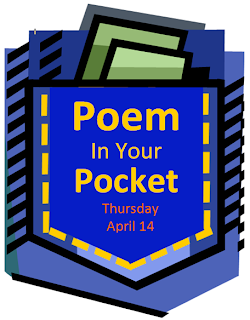 One day we were planning out our activities for Poem In Your Pocket Day and thought it would be fun to invite others to celebrate with us. 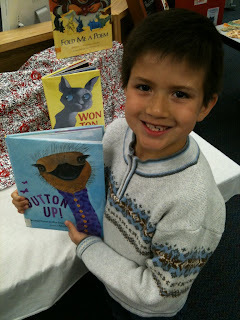 We planned a similar event for LitWorld's World Read Aloud Day and it was so much fun! Within minutes a Google Doc was created and the collaboration began! Diane Cordell from New York, Steve Gagnon from New Hampshire, Donna Kouri from Illinois, Jen Malphy from Wisconsin, and Kathy Schmidt from Georgia quickly jumped on board and plans formed for this special day. The day arrived and there was excitement in the air! Teachers and students passed out stickers that read "Ask me about the poem in my pocket." An email was sent out to remind everyone to be ready to share their poem and ask others to share too. 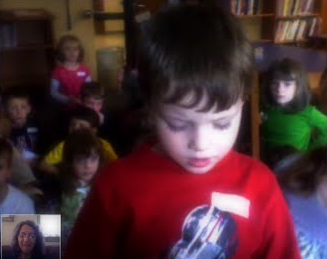 In the library there were Skype connections throughout the day that connected students, adults and ourselves to a wonderful poetry experience. We love these two photographs that show the connection between our kindergarten students and Diane in New York. 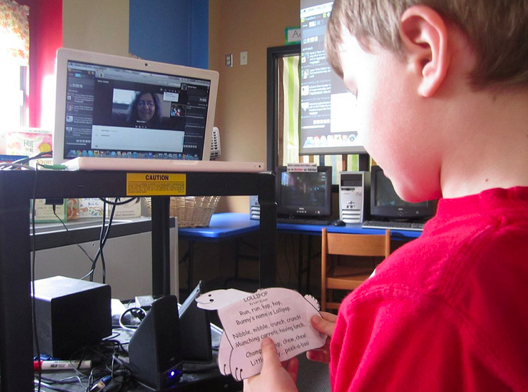 This student had the perfect poem that he practiced and was proud to share with a new friend over 1,000 miles away. After they shared, she read a poem her son wrote when he was a little boy and shared Hush, Little Alien by Daniel Kirk. 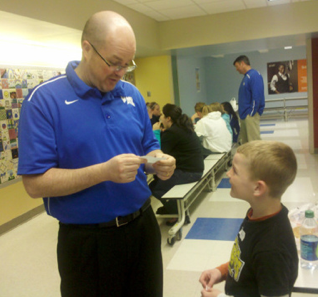 The students even got the administrators and teachers involved in Poem In Your Pocket Day. This is a day that Van Meter and Brook Forest will never forget and one that we will celebrate together next year. 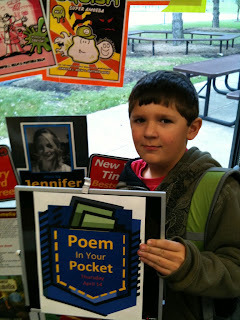 it doesn't have to be Poem In Your Pocket Day to share poetry with your friends. Wow! What a fantastic celebration. Congratulations! This is great! Thank you for sharing your wonderful experience. I too, want to get better organized for this day next year. 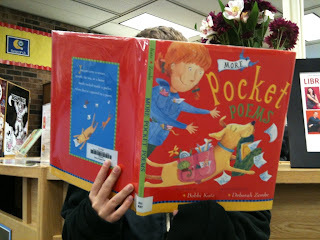 Poem In Your Pocket Day is so much fun. 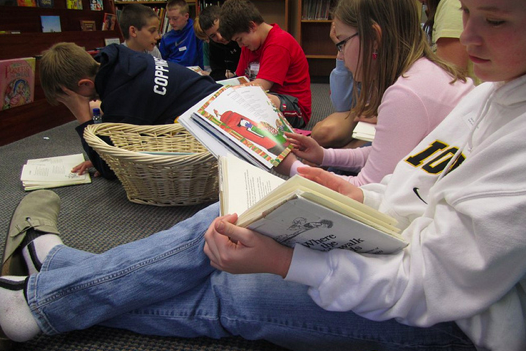 I was a third grade teacher before becoming a librarian. My third graders loved it. 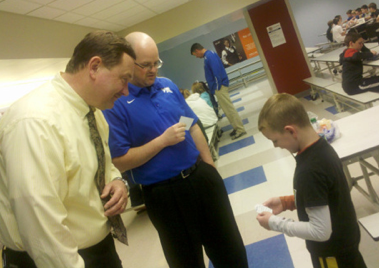 I'm happy to share this experience with the entire school and schools around the country. it was So much fun - thanks Shannon & John for coordinating and getting me involved!